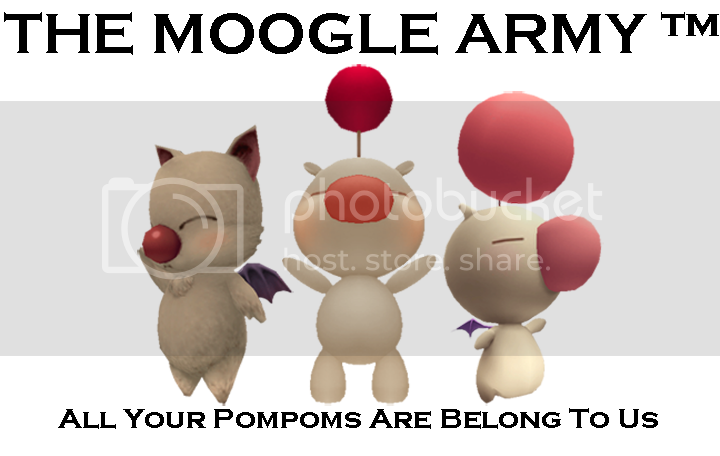 The Moogle Army™ - "We're Kupo!" 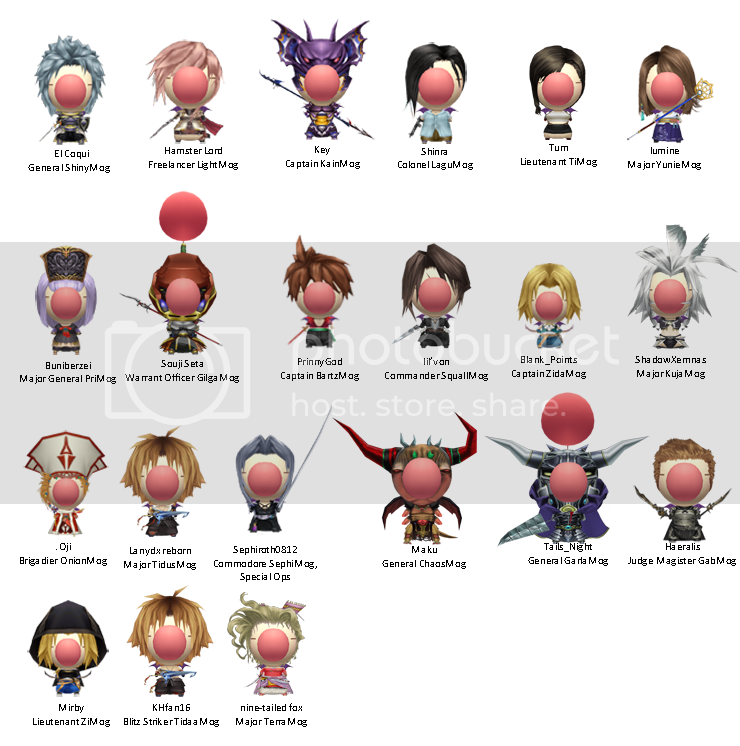 All new recruits please consult the current roster before determining your Moogle. These are the games I actually have models for. Any character from the listed games, I can make, and will be the most convenient for me overall. Some of the characters have more than one outfit. You'll need to specify which. The name of the character. Step I - Send an enlistment request to Admiral RiMog through PM, with the specifics of the uniform you wish to receive. I ask that no one be afraid to request enlistment, as you'll most likely be approved instantly. Just... not added to the roster because that takes a bit more time and will be done at a later date. Please contact Admiral RiMog (Sign) for more information. This is the best thread ever! KUPO! That said, ALL HAIL THE POMPOMS! Ah, thanks for the heads up, Vice-Admiral! I asked to join TMA a while ago, but still got no response. 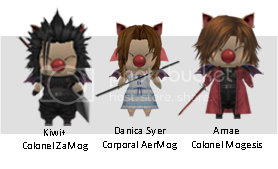 And it looks like my desired moogle was taken as well. EmperMog; my love for you is overflowing. Ah...yes, now we also have a home base, kupo. 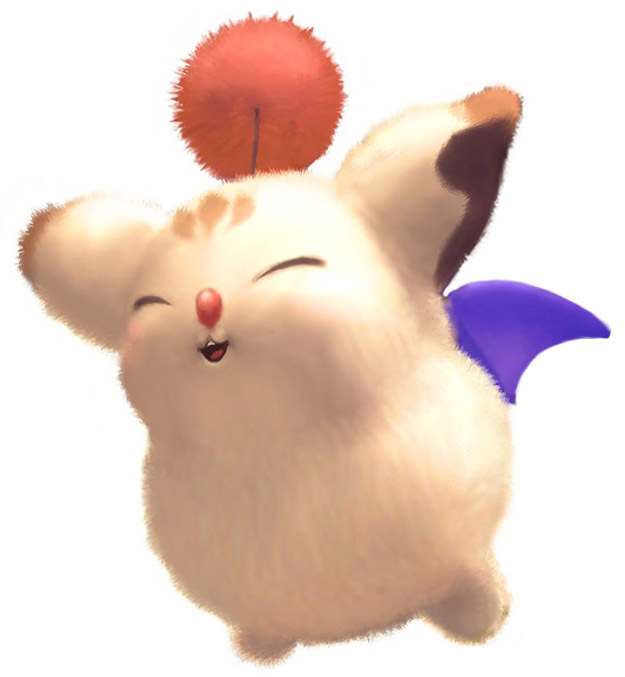 Let's see...there's already Captain TerMog...hi there, kupo. Master XehaMog as well, greetings to the darkness, kupo. EmperMog, your horns look very imposing, kupo. 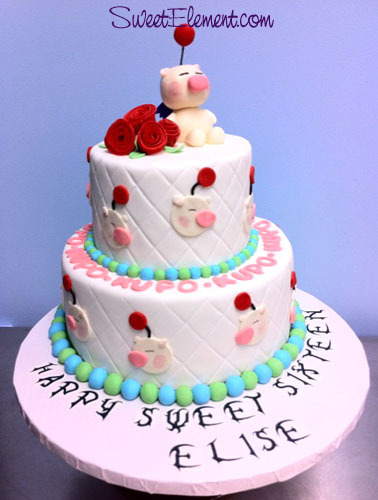 Once all members are gathered shall I spend some Kuponut-cake, kupoo??? they will cower in fear at the sight of our noses and pompoms. That message was mere illusion! You're not actually seeing it, kupo.